At E3, GungHo revealed the stylish-looking Ninjala. This game is being created exclusively for Switch with a release planned for 2019. 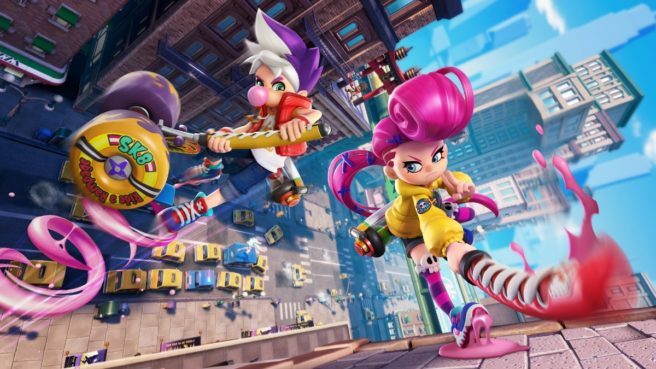 There wasn’t too much information about Ninjala shared coming out of E3, but Japanese website 4Gamer managed to speak with a couple of people behind the game. Scenario creator / producer Kazuki Morishita and development director Takeshi Arakawa both chatted about how long it’s been in the works, the decision to release it on Switch, and details like the gameplay. Nice to meet you both! I was surprised as soon as I saw your booth. Why did you chose to reveal your game here, instead of during the presentation? I guess that means you successfully tricked me! Morshita: In order to prevent anything from leaking early, we covered the whole booth with a curtain. We were stealthy like ninjas up until this point [laughter]. Arakawa: We were hiding behind the scenes. Does that include the development as well? Morishita: Yes. From development started until now. I’m relieved that we can finally talk about it! When did you start planning this game? Morishita: About five years ago. [I] wanted to make an action oriented battle game that both kids and grownups could enjoy. At that point [I] just happened to see a sports sword fighting show and thought, “Oh yeah, when I was a kid I loved sword fights and pretending to be a ninja,” and I realized that we could combine those two things. What made you decide to develop this for the Switch? We wanted to make a game where lots of people could gather and have fun. When we heard about the Switch we realized that the hardware was perfect for that type of game. A game where we could create something with true craftsmanship. Since you’re experienced, what did you think when you first heard the plan for this game, Arakawa? Arakawa: It’s about two years ago, I wanted to make something that related the experiences I, and most others had growing up as a kid. ‘We want this feeling to be conveyed through an action game’ they explained. I was originally an ‘iga-ryu ninja’ myself, so that left a big impression. Arakawa: Either way, we’ve been having conversations like this for the past two years [laughter], so we decided we might as well make a game out of it. So what kind of world can we expect from a game based on those kinds of conversations? Morishita: There is a place called WNA, with the purpose of continuing the existence of ninjas and they make something called Ninja Gum. If a child with genes from a ninja chews this gum, their latent ninja powers will awaken and give them various abilities. So it’s not just a battle game, but it also has a story mode? Morishita: There is a single-player mode, but this is mostly just the backstory. There are eight characters in this game and each has their own backstory. That’s interesting! What kind of stories can we expect? Morishita: For instance the pink haired girl called Berecca, is a researcher at WNA and has ninja genes, but after she invented and tried the Ninja Gum she became this tiny character. That’s just one, but each character has their own eccentric story. I see! When Arakawa suddenly started talking about being an Iga-ryu Ninja descendant I was wondering what was going on, but I wasn’t expecting it to be related to the game…. What can you tell us about the action in the game? Morishita: Up to eight players can compete using weapons such as sticks and hammers made by inflating the Ninja Gum. You can damage each other and get points or also do an IPPON! and the person with the most points wins. It’s simple, really. There are other ways to gain points, but the IPPON! is the main one. Chewing gum, making weapons, dashing and so on.. the gum really is the key. Arawaka: By blowing bubbles, you get to use Shinobi [ninja] powers, but the powers will change depending on the size of the bubble. By blowing a small bubble you can make a weapon that’s easy to use but light on damage, but if you blow a bigger bubble you can make a weapon that can IPPON! someone out in one shot. If you attack lots, your gauge will build and you can use special powers which vary depending on the weapon, so it’s quite interesting! Sounds like you could easily be attacked by something sneaking up on you from behind while you’re distracted by a different opponent. Morishita: That and being able to get an IPPON! feels great! On the other hand if someone gets an IPPON! on you, it’s terrible. Arakawa: Deciding how to inflate the gum and use it to get an IPPON! Once you figure out a strategy it’s a lot of fun! In a battle between beginners it’s sort of like a kids sword fight, but it’s something else entirely to watch the movements and attacks of more experienced players. It starts to look like real ninjas are fighting. The game itself is really lively, but can you tell us a bit more about the use of color? Morishita: We wanted to use vivid colors right from the start, but more importantly we want to use colors that suit the Nintendo hardware. Bright, fun colors that won’t make Nintendo users across the world feel like there’s a ‘gap’ somewhere. Tell us more about the demo that’s being shown at the exhibit. Morishita: It’s like when you go to a new ramen shop and have ramen there for the first time. I’m not sure I understand. There are lots of toppings to try and flavors to enjoy but first you start with the basics. In that same style, we want people to know how much fun the basics of the game can be first. Going back to the beginning, why did you pick E3 2018? Morishita: America is a big country and E3 gathers lots of attention, so we wanted to see the reaction of people all over the world. We also want to start getting the name of the game out there and to spread awareness. There hasn’t been an official Japanese announcement, has there? Morishita: We want to see the reaction of America first. Basically we’d like to have our games available in every country that plays games and ideally to publish them in all countries at the same time. We look forward to hearing more good new about expansion into other territories globally and in Japan. Thank you for your time!